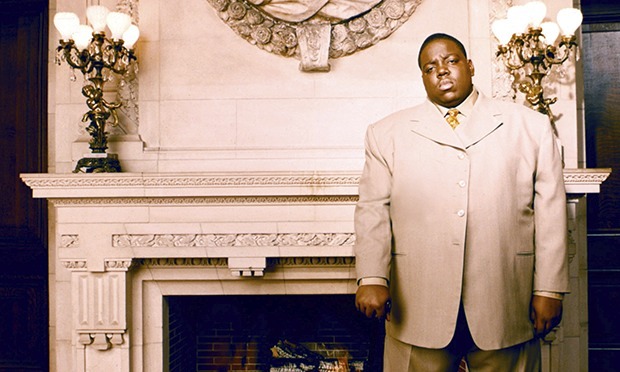 Happy birthday, Biggie! Christopher Wallace a/k/a Notorious B.I.G was born on May 21, 1972 and raised in Bed-Stuy. Today Notorious B.I.G is remembered as one of the greatest rappers of all-time, after a mercurial rise to the top, an incredibly short career, and a dramatic assassination that sent shockwaves through the country. Wallace started dealing drugs and free-style battling as a teenager, at one point landing in jail on a weapons charge. He briefly attended George Westinghouse Career and Technical Education High School, where he met future rap stars Busta Rhymes, DMX, and Jay-Z. (I hope the school gets strong alumni donations.) Biggie released his first and most iconic single, “Juicy”, in August of 1994, soon followed by his first album, the ominously titled Ready to Die. He would not release another album until after his death, the even more ominously titled Life After Death. Efforts to name a street after Wallace in his home neighborhood were met with significant pushback at Brooklyn’s Community Board 2, where some members think his misogynistic lyrics, criminal exploits, and even his girth precluded him from having a street sign honor him. In retrospect, his lyrics are cringingly misogynistic and homophobic, but he probably would have grown out of his raunchier, less sophisticated content, as Jay-Z sortof did. He was only 24 years old, after all. I called Community Board 2, and received confirmation that the street proposal as of now is as dead as Wallace himself. The person with the greatest power to honor Biggie via street signage is the local councilmember, Laurie Cumbo, so fans can reach out to her to make such a request. Outraged by the afternoon’s events, I went back to the office and initiated a formal process to have the Field of Dreams, which was neither a field nor filled with dreams, renamed “The Big Pun Courts.” The proposal got kicked around upstairs until a few weeks later, when I was summoned to Parks Commissioner Henry Stern’s executive office overlooking the Central Park Zoo. (Working for the Parks Department has its perks.) While I made my pitch he nodded and chuckled along, then asked what I thought of Big Pun’s misogynistic and homophobic lyrics. It turned out, he said, that the Bronx Borough President Freddie Ferrer had vetoed the park renaming on those grounds. A few years later Ferrer was decimated in the mayoral election against Michael Bloomberg. Stern liked my moxie for trying to change the park name, and bestowed me with my own parks department name: Big Pun. This grainy photo from NY History blog is the only picture I could find from this rally. If you’ve got a better one, lemme know. Today is also the 105th anniversary of a major march and rally for suffrage at Union Square, which went down on May 21, 1910. There were many rallies, protests and debates that took place in New York, the hub of the suffragist movement, before the 1920 ratification of the 19th Amendment. Yet the 1910 push came at a pivotal moment in the women’s rights movement. The previous decade had seen the death of Elizabeth Cady Stanton and Susan B. Anthony, and after initially winning the right to vote in four western states, women hadn’t convinced any legislatures since 1896. From 1910 to 1912, however, women won the right to vote in five states, and seven more before the decade was out. 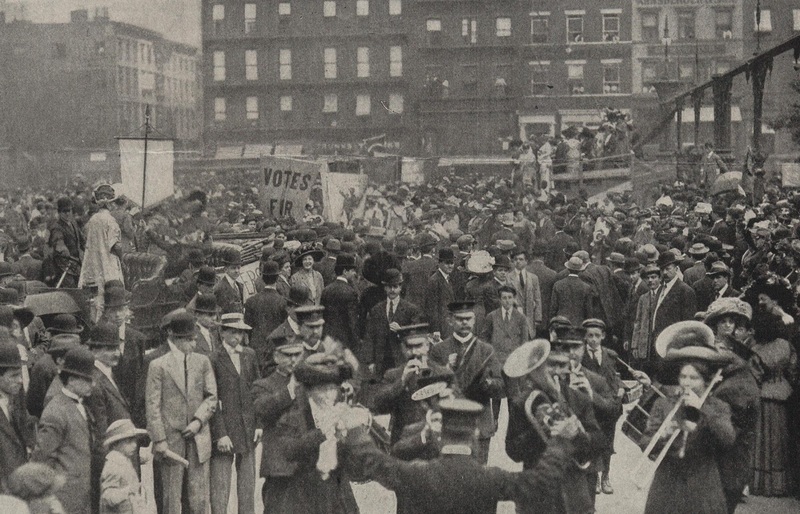 The protest on May 21, 1910 was a lively affair. As if the sight of large groups of women marching together wasn’t uncommon enough for the time, the suffragists stood out by wearing yellow clothes and sashes, as yellow was the official color of the women’s suffrage movement. Socialists in attendance rocked their usual red. They also used props such as baby carriages, which were in turn filled with protest supplies. The carriages were a response to anti-suffragists, who denounced these protesters as anti-feminine; the carriages symbolized that one could be both a mother and a protester. The march also included at least 90 cars, many of which were commandeered taxi cabs (for the yellow). This added to the spectacle, and also caused a minor riff between the economic classes of the suffragists, as cars were very much a plaything of the wealthy at that time. (One of the reasons for the rapid success of the suffragists during the 1910s was the strong financial and political backing of upper class New York women.) For the following year’s suffrage parade, the cars were kicked out, and the movement worked much harder to bring in working class women. For the record, women earned the right to vote in New York in 1917, during their second major legislative push, beating the 19th Amendment by three years. I’m off to party to my bachelor party in San Juan, so the site will be quiet for a few days. Happy beach-opening weekend! Please do your homework. The “B” initial in the middle of Susan B. Anthony’s name stands for Brownell, a family name. I suggest you take a train, as she often did when traveling the country campaigning for abolition of slavery & woman suffrage, up to Rochester, N.Y. to visit her home which is a museum. Here you will find all the accurate information you might need about Miss Anthony & her friend & colleague Mr. Frederick Douglass. Research before writing is the key.